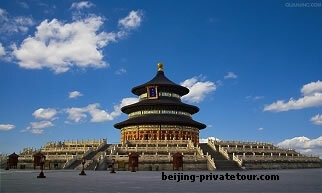 Beijing private tour, the long history of Beijing. Some half a million years ago, Peking man lived in Zhoukoudian, in the southwestern suburbs of Beijing. The climate of that time was warmer and more humid than it is today. Forests and lakes in the area supported large numbers of living creatures. The fossil remains of Peking man, his stone tools and evidence of use of fire, as well as later tools of 18,000 years ago, bone needles and article of adornment from the age of Upper Cave Man are the earliest cultural relics on record in China today. Some four to five thousand years ago, settlements to the southwest of Beijing were thriving on basic agriculture and animal husbandry. Story has it that the legendary Yellow Emperor (Huang Di) battled against the tribal leader Chiyou in the "wilderness of the prefecture of Zhuo. "Zhuolu, a town west of present day Beijing, is perhaps the site of the first metropolis in the area. Yellow Emperor's successor, Emperor Yao, was said to have established a legendary capital Youdu (City of Quietude) that was where the city of Ji was actually built. During the Warring States Period (475-221BC), the Marquis of Yan annexed the territory of the Marquis of Ji, making the city of Ji his new capital. The approximate location was north of Guang' anmen Gate in presentday Beijing near the White Cloud Temple (Baiyunguan). Early in the third century BC, the first Emperor of Qin (Qin Shi Huang) set about conquering six states and unifying China. The city of Ji was named administrative center of Guangyang Commandery, one of 36 prefectures in China's first feudal empire. For 10 centuries, through to the end of the Tang Dynasty (618-907), Ji remained a strategic trading and military center and the object of frequent power struggles. Two emperors during that period -- Emperor Yang of the Sui Dynasty (581-618) and Emperor Taizong of the Tang Dynasty -- left their mark on the city. Emperor Yang amassed troops and supplies at Ji for expeditions against Korea. Emperor Taizong also used the city for military training. He built the Temple for Compassion for the Loyal (Minzhongsi), which is dedicated to troops who died in battle. This temple was the precursor of the Temple of the origin of the Dharma (Fayuansi) located outside the old walls of the city. At the beginning of the Tang Dynasty, Ji was little different from any other large feudal cities. Several centuries later, however, when the Tang was nearing a state of collapse, the Qidans (Khitans) came from the upper reaches of the Liaohe River and moved south to occupy Ji and make it their second capital. They called the city Nanjing (Southern Capital) or Yanjing. Emperor Taizong of the Liao Dynasty (916-1125) carried out reconstruction projects and built palaces, which were used as strongholds from which the Qidans set out to conquer the central plains of China. In the early 12th century, the Nuzhen (Jurchen) conquered the Liao and established the Jin Dynasty (1115-1234). In 1153, Wan Yanliang moved the Jin capital from Huiningfu in present day Liaoning Province to Yanjing and renamed it Zhongdu (Central Capital) as a challenge to the Southern Song Dynasty (1127-1279), which had its capital at Lin'an (present day Hangzhou). Before the ascension of Wan Yanliang to the throne, the city of Yanjing had changed little from the Liao period. The rebuilding of the new city began in 1151 with expansion to the east, west and south. Palaces were constructed on a scale similar to the Northern Song (960-1127) capital at Bianliang (modern Kaifeng), and many of the actual building materials were transported from Bianliang. The new expanded city, with its splendid buildings in the center measured roughly five kilometers in circumference. The registered population of the Imperial Palace in the center measured roughly five kilometers in circumference. The registered population of Zhongdu amounted to 225,592 households, or approximately one million people. Mongol armies occupied Zhongdu in 1215. At this time, the city of Kaiping (in present day Inner Mongolia Autonomous Region) served as the principal Mongol capital (Shangdu), while Yanjing was given provincial status. It was not until 1271 that Kublai Khan formally adopted the new dynasty's name -- Yuan -- and made Yanjing the capital. Kublai Khan rebuilt the city and gave it the Chinese (Han) name of Dadu (Ta-tu) or Great Capital, though in Mongol it was known as Khanbalig (Marco Polo's Cambaluc), the City of the Great Khan. When the Mongols finally eliminated the Southern Song and unified China, Dadu became the political center of the country for the first time in history. The construction of Dadu began in 1267 and ended in 1293, extending throughout the entire period of Kublai Khan's rule. The magnificent palaces of the Jin capital Zhongdu were destroyed by fire during the dynastic turnover from the Jin to the Yuan. When the capital was rebuilt, the original site of Zhongdu was replaced by a larger rectangular area centered in a beautiful lake region in the northeastern suburbs. The construction of Dadu consisted of three main projects -- the imperial palaces, the city walls and moats, and the canal. The first stage was construction of the palace buildings, most of which were completed in 1274. The next stage was construction of the mansions for the imperial princes, the government offices, the Taimiao (Imperial Ancestral Temple) and Shejitan (Altar of Land and Grain) to the east and west of the palace, and a system of streets for ordinary residences. In 1293, the strategic Tonghui Canal, connecting the capital to the Grand Canal, was completed. "You must know that it is the greatest palace that ever was -- the roof is very lofty, and the walls of the palace are all covered with gold and silver. They are adorned with dragons, beasts and birds, knights and idols, and other such things. The Hall of the Palace is so large that 6,000 people could easily dine there, and it is quite a marvel to see how many rooms there are besides. The building is altogether so vast, so rich and so beautiful, that no man on earth could design anything superior to it. The outside of the roof is all colored with vermilion and yellow and green and blue and other hues, which are fixed with a varnish so fine and exquisite that they shins like crystal, and lend a resplendent luster to the palace as seen for a great way around." The new Dadu was a rectangular city more than 30 kilometers in circumference. In the later years of Kublai Khan's rule, the city population consisted of 100,000 households or roughly 500,000 people. The layout was the result of uniform planning, the broader streets all 24 paces wide, the narrow lanes half this width. The regular chessboard pattern created an impression of relaxed orderliness. Achievements in stone and plaster sculpture and painting at this time reached great heights. The names of two contemporary artisans have come down to us: the sculptors Yang Qiong and Liu Yuan. The latter was known for the plaster statues he created for temples. Liulansu Lane at the northern end of Fuyou Street in present day Beijing was named after Liu Yuan. On August 2, 1368, Ming troops seized Dadu and renamed it Beiping (Northern Peace). Zhu Yuanzhang, the founding emperor of the Ming Dynasty (1368-1644), however, made Nanjing his first capital. Beginning in 1406, Emperor Yongle of the Ming Dynasty spent 15 years constructing walls 12 meters high and 10 meters thick at their base around the city of Beiping. The construction of palace buildings and gardens began in 1417 and was completed in 1420. The following year, Emperor Yongle formally transferred the capital from Nanjing to Beiping and, for the first time, named the city Beijing (Northern Capital). Extensive reconstruction work was carried out in Beijing during the first years of the Ming Dynasty. The northern city walls were shifted 2.5 kilometers to the south. Evidence of great advances in city planning is the district known as the Inner (Tartar) City. The Outer or Chinese City to the south was built during the reign of Emperor Jiajing (1522-1566), adding to the rectangular city a slightly wider "base" in the south. When the Manchus founded the Qing Dynasty in 1644, they began to build suburban gardens, the most famous of which was Yuanmingyuan. Construction over the course of an entire century, the imposing columned palaces and open-air pavilions blended with the serenity of well-planned gardens to create a masterpiece of garden architecture unrivaled in the history of China. A city plan was first laid out in the Yuan Dynasty. Yet only after extensive reconstruction during the Ming and Qing (1644-1911), did the city emerge as an architectural masterpiece fit to serve as the capital of the Chinese empire. A north-south axis bisects the city with the Imperial Palace was knows as Danei (The Great Within). In the Ming, it was renamed the Forbidden City (Zijincheng), and more recently it has come to be called the Palace Museum (Gugong Bowuyuan). Designed with thousands of halls and gates arranged symmetrically around a north south axis, its dimensions and luxuriance are a fitting symbol of the power and greatness of traditional China. After the collapse of the Qing Dynasty in 1911, China fell prey to the Northern Warlords and Kuomintang, Beijing suffered the same fate as the rest of China, hobbling along like an old camel without a sense of direction. The Chinese People's Liberation Army formally entered Beijing on January 31, 1949, opening a new chapter in the long history of the city. It was in Tian'anmen Square on October 1st, 1949, that Chairman Mao Zedong proclaimed the establishment of the People's Republic of China, with Beijing as its capital. The city has changed totally since then. It has expanded from its old confines within the nine gates of the Inner City wall (Zhengyangmen, Chongwenmen, Xuanwumen, Chaoyangmen, Dongzhimen, Fuchengmen, Xizhimen, Andingmen and Deshengmen) to the seven outer gates (Dongbianmen, Guangqumen, Xibianmen, Guang' anmen, Yongdingmen, Zuoanmen and Youanmen) and out into the suburbs, Beijing now covers an area of about 750 square kilometers, which includes a dozen new living districts built on the outskirts of town. Tian'anmen Square is still the center of Beijing, Chang' an Boulevard now running 38 kilometers from Shijingshan in the west to Tongxian in the east. The palaces and city towers along both sides have been designated cultural relics for national protection. Former imperial residences and gardens have been opened for public viewing. New buildings like the International Post Office and Bank of China have been built along the Second Ring Road, the former line of the Inner City wall. Old living quarters and blocks of traditional Beijing-style buildings, such as Liulichang Culture Street, have been restored. Large-scale construction has been undertaken along the Third Ring Road and the fourth Ring Road. Choose www.beijing-privatetour.com. You will get more than you might think.